The first Spring after I had been diagnosed with MS and was unable to teach at the university, I saw it as a long awaited opportunity to start a vegetable garden in my backyard. I don’t know why I was so sure of this: I could barely lift a shovel myself, let alone dig out a garden plot. But I had a feeling expanding my garden would be deeply healing for me, and so I was optimistic I could get friends to help with that. Somehow, though I didn’t know quite how, it would all work out. Luckily for me, I was right. That first Spring rainbow chard was becoming popular, and I eagerly tried some seeds. I loved the colorful leaves and stems, and took to it more ardently than the spinach I had loved as a child. Most of my leaves were small, since I do not thin well, but they were scrumptious baby greens. I would toss them into the cooking water with my pasta, and then make a cup of miso soup with the cooking water to sip alongside my dish of pasta, chard and cherry tomatoes. At that time I would still use a splash of olive oil and a sprinkling of parmesan. Now I’d sprinkle nutritional yeast on, and maybe add some sautéed mushrooms. And perhaps mix it with brown or wild rice more often than the pasta. My parents came to see me that summer and enthusiastically embraced my fledging gardening efforts. They brought me a set of garden gadgets, among them a knee pad that said “Love Makes All Things Grow.” It’s long since disintegrated I used it so much, but the gate to the principal vegetable garden and raspberry patch now has that same message printed on the wood in indelible marker that has survived almost two decades of Idaho Winters. They were especially charmed by the multi-colored swiss chard growing in the new garden, so the next Spring I sent them some seeds for their own vegetable patch. Quite a few years after that, my son and I were able to make it down to Sacramento for Christmas. It was December 24th, and the rainbow chard was leafed out with giant leaves, having reseeded itself and gone volunteer, over and over. It was so lush it felt tropical to me, almost, after the rigid discipline of the northern Idaho growing season. So of course I picked a basket of it and put in the veggie lasagna I was making. World’s Healthiest Foods says chard is a member of the chenopod family of plants, along with beets, spinach and quinoa. All these foods contain pigments called betalains with unique healing properties. Chard is the most loaded with them of all. Chard helps with blood sugar regulation. It’s also an anti-inflammatory anti-oxidant powerhouse. It’s a good source of calcium, and an excellent source of magnesium, which is great for easing fibromyalgia soreness flares. With its beautiful rainbow of colors and its exotic botanical family name, it’s the peacock of greens as far as I’m concerned. I love kale, but chard has the kind of “both/and” magic that occurs when opposites, even opposite colors, come together. 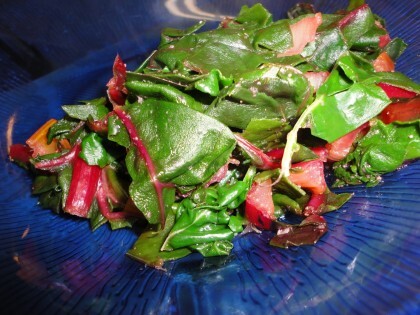 A little while ago one of my wonderful readers asked if I would share my “recipe” for steamed chard. Of course the straightforward short answer to that is chop or tear it up and put it in your vegetable steamer and steam for no longer than five minutes. And I do often do this, usually along with other veggies, like carrots, parsnips , leek rings and Brussels sprouts. Those go in for 3-5 minutes on their own. Then the chard leaves get another 3-5 minutes. Certainly no more than 5. You want them at the very least wilted, at the most soft, but bright green. But what if there are some days I’m just too lazy or tired to get out the steamer and insert it into a pot, or the thought of washing all the pieces after puts me off? Or my muscles are especially sore or tight, and I really want a chard fix. Here’s what I do. I pull my 10 inch green gourmet non-stick skillet off the pot rack (I used to tell people that when I died I wanted to be buried with my bicycle and my pot rack), and put it on the stove. I tear up chard leaves into pieces like I would lettuce for a salad. I chop up the stems like celery. I put a splash of water (maybe a couple of tablespoons, no more) in the skillet. I heat it on medium until the water starts to dance. I throw in the stems and sauté them for a minute or two until they start to turn brighter and the water is mostly evaporated. Then I add another splash of water, the chard leaves and a dash of garlic granules. Then I cover the whole thing with a glass lid, and let the leaves sweat and soften for about two minutes. (if you’re afraid of it sticking you can add more water, but not too much.) Then I stir it up and eat it. Just like that. Or with a dash of nutritional yeast and ground flax, or a splash of my homemade raspberry wine vinegar. It’s tasteful chenopod heaven. In the kind of lovely serendipity that happens between friends, Susan and I wrote our posts about Swiss Chard at the same time without knowing the other was doing so. And as Susan’s great current recipe for Swiss Chard with Crisp Apples points out, chard can taste bitter to some people. I have always been such a lover of pungent, peppery or even bitter greens that I sometimes forget this. (Eating dandelion greens in soup or salad is in my Italian ancestral imprint.) So if you are one of those people “educating” your tastes to new experiences, but you are shy of what might be considered “bitter,” then give her cool taste combination of fruit and chard greens a spin. Adding fruit is a wonderful way to “play” with your greens, and something I often do too, just for the fun of it when making a salad or a saute. A word about the stems: if you like to crunch, they are not to be missed. And their tangy taste adds variety of flavor, not to mention color. It took me a while to appreciate them, but now I am a very big fan. I used to exclaim out loud to myself when Susan would write in a recipe using chard or bok choy, such as Pasta with Chard and Chickpeas to “set the stems aside for another use” what in the world that “other use” might possibly be. But now I know. They are wonderful in a medley of steamed veggies, a stir fry, a soup broth, even a salad–you name it. Remember the game “green light, red light”? We know to run with edible greens for help with antoxidants and lower cholesterol. But it turns out that the red veggies do even MORE at a cellular level to stop unwanted oxidation by providing a nutrient that the blood cells in the liver can recognize. You can watch a very short neat video about this called Anti Up on the Veggies at Dr. Gregor’s cool site, NutritionFacts.org. So I’ve reinvented the game “Red Light, Green Light.” I “go” for the greens, but don’t “stop” at the leaves (thin ribbons of raw chard leaves in all shades can frequently be found in my salad bowl). I keep going until I “end up” loving chard so much I’ll even eat those bright red stems cut up raw in a salad (yes, I’ve been known to do that repeatedly. Sometimes they don’t even make it into the bowl. They go right into my mouth, like celery slices. ). I know my heart, my most important muscle, thanks me for feeding it to function as the best “traffic light” I could ask for amid all the stops and starts in life. I am so envious that your chard reseeds! I’ve never had that happen with any of my greens. The most I can say is that I’ve had one of my chard plants for about 3 years. By keeping it in the shade in the summer, I’ve been able to keep it alive. I can’t wait until my next harvest so that I can try it with raspberry vinegar and nutritional yeast. I know it will be delicious! Thanks so much for the comment! I think having one chard plant for 3 years is just as good as reseeding. Actually it was parents’ chard that reseeded–down in California. Up north here I can get mustard greens, broccoli rabe, arugula and even some kale to reseed. Parsley, of course, and sometimes even a bit of cilantro. Since i have fallen back in love with chard, I will plant some again next Spring, and if I get lucky see if one might go to seed. But I suspect, like you, I will still be wishing! I hope you enjoy the raspberry vinegar and nutritional yeast treatment. You have convinced me to give growing chard a try. I have grown kale for the past three years, but last year it did not do well! Lots of bugs. I miss going out nearly everyday for fresh kale leaves! The seed catalogs have just started to arrive…. Hi kelly! I know what you mean, those little bugs can be discouraging. (I read somewhere that planting dikon radish with kale discourages flea beetles. I couldn’t find seed for that so I did regular radish and it seemed to work, too. Or maybe it was cold enough during the winter to kill them off. It’s always an experiment!) The thing I love about gardening is every season is different. There’s always surprises. Maybe you won’t have bugs on your kale this year. And maybe this year will be the year you grow chard! I love it when the seed catalogs start to arrive. Thank you so much for this post! I make my chard (and other garden greens) in tons of ways and usually just substitute it for spinach (for some reason I always eat my spinach raw…), but I almost never steam them. What a wonderful idea! I appreciate you posting this sooooo much! I will definitely be steaming some chard and brussels sprouts leaves now! You are so very welcome, stephanie! It was my pleasure. I had fun writing it. I hope you enjoy your steaming experience! Wow, I am in awe of your reseedlings. I am trying to grow more greens in my veggie garden, and last summer, the bugs got most of it, and left me only a small amt. The kale and swiss chard did not grow as well as I hoped! hope next yr will be better. I am going to look out for the reseedlings since I left the garden alone for the winder. Maybe I will see some of those precious plants trying to reseed themselves. thanks for your recipe for steaming, I will try it. I like to put chard in most everything! Thanks, carollynne! The magic of gardening is that its different every year. So maybe your greens will have a better year this year. And maybe because you didn’t till up before winter you will see some tiny seedlings. I hope so!! Nice to hear from another chard lover, too. Good morning Maria! Thank you for your always positive, mouthwatering blogs! You are an inspiration for us all. We used to have a garden when we lived in California (started in Stockton which is about 40 miles from Sacramento!) and I LOVED it! My parents are the ones that got us started as children and I’ve had the bug ever since. We now live in Henderson, NV which is HOT (putting it mildly) and the place we rent has nothing but rocks, rocks and more rocks so no place to garden. Over the years, I’ve tried planters and other containers but nothing has worked. Everything dies even with daily care and water (when needed). I MISS walking out and getting fresh veggies for daily meals. Do you have any suggestions for working with our weather? I am willing to try again, I just hate wasting the money to buy things and then have them die. I’d appreciate your input. His books are more “about” than “how to” but they might give you some ideas. Perhaps also you could create a sort of inexpensive structure that creates shade/dappled light for the greens so they are not always in direct scorching sun. I would love to hear what you come up with, and wish you the best of luck creating a desert–I hope to hear that you got a good start! Wow – I never knew how good chard was for you! I am going to have to add it back into my diet; it has been excluded since I started the E.D. more than a year ago! However, it is on sale this week at the store down the street from me, I noticed today….might need to cook me up some chard and apples! I had no idea you could reseed chard, either! There is so much about gardening I do not know. One day, hopefully, I will learn.